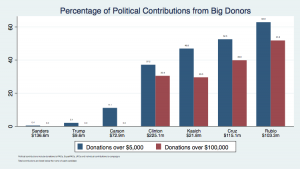 With Marco Rubio out of the race, Ted Cruz is now the presidential candidate relying the most on large donors, according to the Stigler Center’s latest analysis of the candidates’ fundraising records. Last month, the Stigler Center launched its Campaign Financing Capture Index, a new project that tracks the attempts of large political contributors to affect public policy, by focusing on the fraction of total funds raised from large donors. 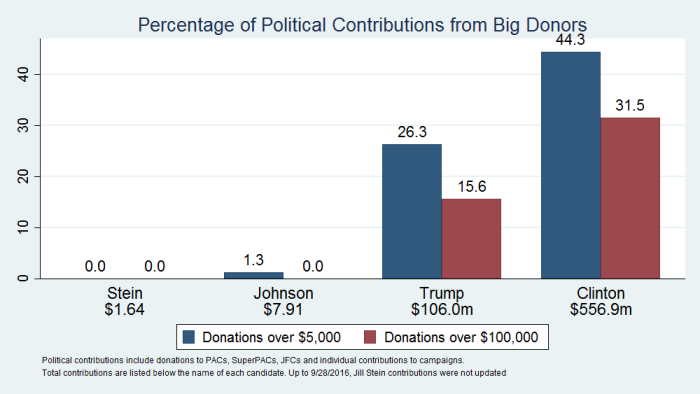 The index analyzes the distribution of political contributions to presidential candidates and takes into account individual contributions, as well as contributions made to the JFCs, PACs and super PACs that support each candidate. The idea behind the index is that large political contributions represent more than mere expression of political preference. More likely, they are aimed at altering policy in favor of the donor’s interest than promoting the public interest. This problem becomes particularly severe when the percentage of funds raised by large donors is significant. 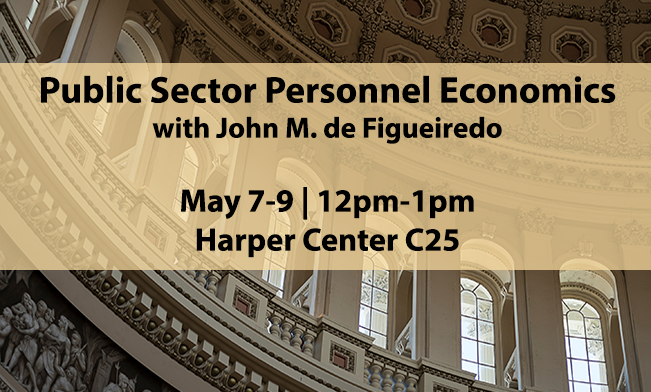 The more concentrated the sources of funding to political campaigns, the higher the risk of politicians’ dependence on special interest groups. According to the latest data, 52.5 percent of the $115 million raised by the Cruz campaign and by PACs and Super PACs backing his candidacy came from donations above $5,000. 39.9 percent of the donations Cruz received came from contributors who gave more than $100,000. 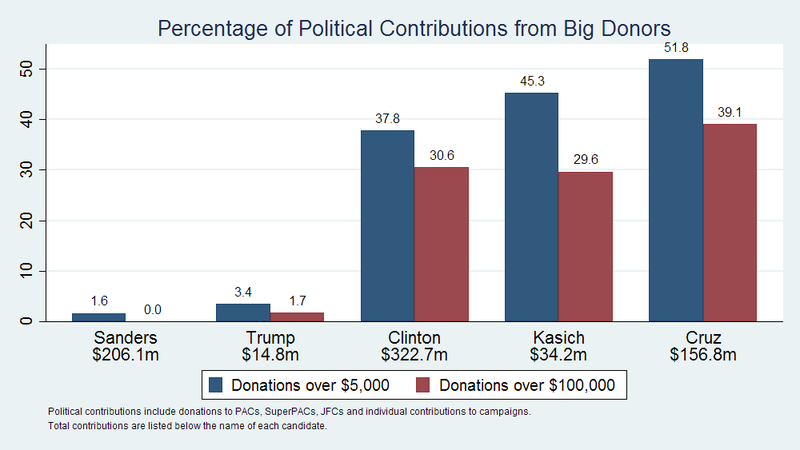 Overall, the analysis reveals that three of the remaining five presidential hopefuls–Ted Cruz, John Kasich, and Hillary Clinton– have received 30 percent or more of their contributions from large donors contributing more than $100,000. 46.8 percent of the donations supporting Kasich’s candidacy came from donors contributing over $5,000, as did 37.2 percent of the donations supporting Clinton. Nearly a third of the contributions Clinton received, according to the data, were over $100,000. In February, Marco Rubio, who dropped out of the race last week, remained the candidate with the largest concentration of large donors. Recent filings reveal the extent to which large donors poured money into Super PACs backing Rubio’s failed presidential campaign prior to his defeat in Florida. As of February 29, Rubio received donations totaling $103 million (including PACs and Super PACs). 62.9 percent of those funds had been donations over $5,000. Nearly 52 percent came from donors contributing over $100,000. During his candidacy, Rubio received the endorsements and financial backing of many billionaires and multimillionaires. Recent filings show that as his chances of beating Donald Trump became slimmer, Rubio’s large donors increased their spending in order to help his last-ditch effort. One Super PAC backing Rubio, Conservative Solutions, raised $25 million in February alone, thanks to seven-figure contributions from Oracle Chairman Larry Ellison, the hedge fund manager Paul Singer, and Missouri businessman David Humphreys. Bernie Sanders and Donald Trump remained on the low end of the Index. Sanders, who raised $43.5 million in February, has so far received only 0.4 percent of his donations from donors contributing over $5,000. Trump, who loaned his campaign another $6.85 million in February, has only gotten 2.1 percent of the $9.6 million he received (from individual donors, PACs and super PACs) from donors contributing over $5,000. Both candidates received no contributions from donors giving $100,000 or more. The analysis was done based on data collected from the FEC website, which, as of this installment of the Index (March 22, 2016) lists the reports for campaigns, PACs, JFCs and Super PACs (only for direct campaign donations and major super PACs) from 2015 through the end of February 2016. 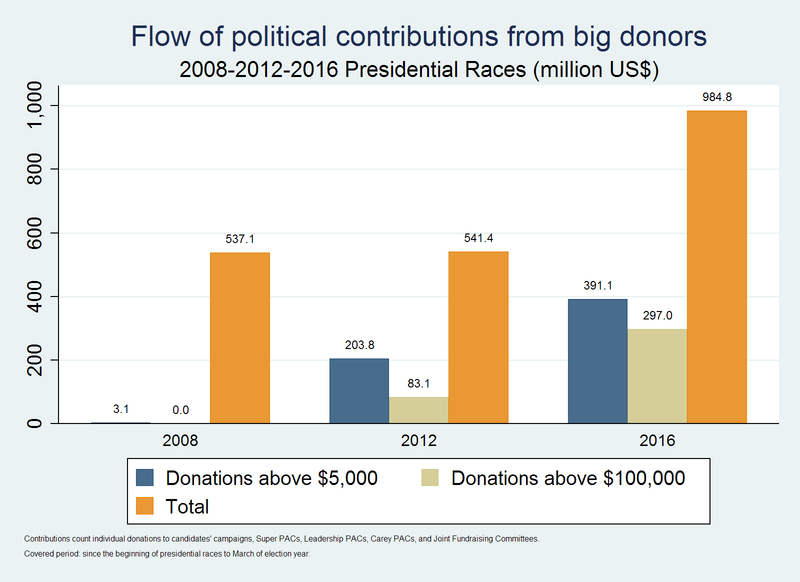 Researchers at the Stigler Center believe that there may be significant changes in the concentration of political contributions as the race progresses. The Center will publish a concentration and distribution analysis every three months until the presidential elections.